University Council member Jenny Pyper. Jenny Pyper joined the Utility Regulator as Chief Executive in November 2013. The Utility Regulator is a non-ministerial government department responsible for regulating NI’s electricity, gas, water and sewerage industries to promote the long term interests of consumers. Jenny leads a team of around 80 people, mainly engineers and economists and is also co-chair of the Single Electricity Market Committee (SEMC) which regulates the £2.5bn all-island wholesale electricity market. 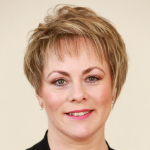 She is a BSc Honours graduate of Queen’s University, Belfast, who joined the NI Civil Service in 1985 and worked in a wide range of economic development areas including tourism, enterprise and inward investment policy, sector training and development and innovation policy. She was appointed to the Senior Civil Service in 2004 as Director of Energy Policy in the Department of Enterprise, Trade and Investment where she managed policy and legislative responsibilities in relation to the electricity, gas and renewable energy industries in Northern Ireland. She moved to take up the post of Director of Regional Planning and Transportation in the Department for Regional Development before being promoted to Deputy Secretary in the Department for Social Development in July 2011, with responsibility for urban regeneration and community development. She is a Fellow of the Geological Society of London (FGS) and is married with 2 children at university in Glasgow and Manchester.